Description: This book with MP3s addresses articulation and style situations that are commonly found in jazz music by introducing a set of guidelines that can be used to make decisions regarding the treatment of notes and rhythms in the swing style. It includes exercises and catchy tunes that can be used to sound more stylistically accurate and authentic, which makes this a valuable resource for directors, individual students, combos, and big bands. 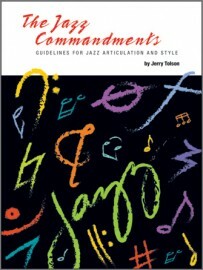 Players will see immediate improvement in jazz articulation and style performance. The recordings below are in the order they appear in the book. You can download all the recordings as a zip file (116MB).